Hello folks. In this beaitul month of July, we have some holidays in Indonesia. Would you spend them in the right place? Or maybe you just use them for relaxing in your own house? It’s totally up to you. But, if you prefer the first choice, we have an option for you to visit the beautiful island in Bali. Not for its beach, nor mountains. But, the place is a hotspring called Banjar Singaraja Hotspring as you can see in things to do near Banjar Hot Spring. There’s something different about this article though. If in the usual occasions we usually talk about some of the best attractions in certain areas, now we want to focus on this hot spring only. Of course we’re gonna give you some information about the venue, and also there’s one additional topic which is its story. The Banjar Hot Spring which looks as beautiful as things to do In Banjar Bali also has one story of its existence. There’s also a history about the legendary Banjar Village, which is also worth to see. So, here it is the story of hot spring at Banjar Singaraja Bali. Before talking about the history, we better know about the Banjar Hotspring first, at least its general specifications. The Banjar Hot Springs is one of the best and popular hot spring in the island of Bali. It’s not only famous for locals, several foreigners are also coming to this place for having a perfect relaxation. Like the name of the place, the hot spring is located in the area of Banjar Village, in the Buleleng regency of Bali island. If you want to go to this venue from Singaraja area, it’ll only take for about one and a half hour, taking the trip of 25 km. For those who happen to stay at capital of Bali island, which is Denpasar, they can take the journey of 80 km to finally be able to reach the Banjar Hot Spring. People usually come here to have the hot spring of course, but some of them are alwaays hunting for the nearest popular beach, called Lovina. The beach that known for its dolphins. They always come to the beach occasionally, so be sure to come at the right time. Back to the hot spring again, it actually has three main pools or springs. For the first pool, it has eight shower which have the shape of dragon’s mouth. It has 1,5m wide and 12m long with 1m depth. For the second pool, it is much bigger than the first one. It has for about 10m wide and 12m long, with leveled depth. The lowest deepest is 2m with 1m shortest. But, unlike the previous sprins, it only has five showers. Regardless of the number of showers there, the second springs is always being a favorite one than the other two springs. The third one is having 3,5m height of showers. People are usually refer this spring to be the healer. Because, the visitors can feel a massage-like experience when they standing under the shower to feel its falling water. It’s actually strong enough to give them a massage. People who have back problems or the other problems with their muscle can come to the third spring to heal them. This Banjar Hot Spring is very relieving and recommended for the people who want to release some stress in a very peaceful venue. The situation around the place is also supporting the hot spring itself, thanks to those green vegetations and trees that making it more cozy. There’s also a small river near the hot spring, which can be enjoyed by the visitors too. It’s very clear and much refreshing. The Banjar Hot Spring is also looks as beautiful as things to do in Seminyak Bali. Before talking about the story of hot spring at Banjar Singaraja Bali, the surrounding village which named Banjar Village also has some interesting stories. This village is considered to be an old village, but not included inside the Bali Aga Villages. Even though it’s pretty old, it doesn’t have any monument or scrolls that can tell us the origin of the village and who found it. But, there’s one reference called Babad “Taru Pinghe” that can tell us some information. There was a great kingdom in Bali called Sweca Pura-Gelgel. The King Ida Dalem appointed Danghyang Wiraga Sandhi as his spiritual advisor. The country was glorified in wealth and goodness because of the ideas from advisor. Danghyang mastered the religion of Hindhu and with that, he was cappable of making the kingdom more peaceful. After staying in the kingdom for so long, he decided to go for his hometown in Java island. After having a permission form the King, he and his Pandita sons finally starting the journey. On his journey, he stopped by the people of Pasek Goblek, who asked him to stay in their village to teach them about spirituality and become a leader for every ceremony in there. Then he stayed there to grant their wish. As expected, the contion in that village is becoming more and more better from time to time. One day, one of his son wants to go to the high terrain of the village. From upthere, Danghyang saw a smoke that coming from a place that sadly covered in reeds. Curius, he immediately gets up and go to that place. In there, he was greeeted by two dogs. They have white and black fur, standing in front of him as the guardians of the area. Through his spiritual power, the two dogs allowed Danghyang to enter the place. He named this place as “Jenggala Kusa”, which means a place of reeds at first. 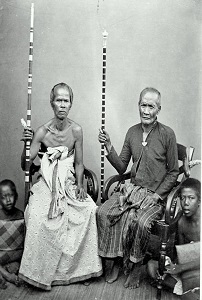 One of his sons, Ida Pedanda Sakti Ngurah Pemada then stayed there with his underlings. Day by days, people start coming in to fill the place because they want to learn about Danghyang’s teachings. And after some times, there were houses and buildings lining up from North to South, which in Bali called Mabanjaran. Thus, the Jenggala Kusa village changed named to Banjar village. Aside from things to do in Lake Batur Bali, the hot spring has some stories. The hot spring already found hundred years ago. It was then maximalized and improved in the Japanese era. The Japanese government built the three pools in order for them to cure their skin diseases. And the existence of the pools still taken care of til today. They used the spring specifically for Japanese government only. And thanks to the end of colonial era, even locals can enjoy the hot spring in the end. People started coming and days by days to be able to feel the experience and the hot spring that said can cure the skin diseases and even make their skin more beautiful. Looking wonderful like things to do in Gretek Bali, Banjar Hot Spring has a myth to cure skin diseases. Is it true? Fortunately it is. The water in the spring contains sulfur which is good for skin. With the proper time of bathing, people can cure their skin diseases. But they need to visit the spring for some times though. That’s the information about story of hot spring at banjar singaraja Bali, hope you can get a lot of information from our article for today. See you!